“… Cortot’s teacher was Louis Diémer, one of Chopin's last pupils and supposed one of his favourites. This means Cortot is in fact the grandson of the Chopin technique, learning from one who was directly instructed how to play these works. Beyond that, he is one of the most remarkable pianists of his or any time, often criticized for an overextensive rubato, but this is the essence of Cortot. He may be the most informed pianist of all time, not only dissecting the notes on the page, but the mind of the composer and life at the time that each composition was invented. 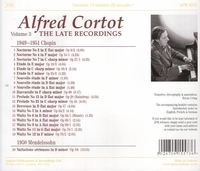 “Alfred Denis Cortot studied at the Paris Conservatory with Decambes and others, winning first prize in piano in 1896. He made his début the same year in Beethoven's Third Piano Concerto. Soon he became widely acclaimed as a performer of Beethoven concerti, appearing as a soloist in two prominent Parisian concert series. In 1898 he went to Bayreuth to study Wagner's music and was hired as a choral coach and then as an assistant conductor. Cortot brought Wagner to Paris, leading the first Paris performance of GÖTTERDÄMMERUNG (May 1902), and a remarkable performance of TRISTAN UND ISOLDE the next month. Also in 1902 he established his own concert series, the Association des Concerts A. Cortot. Although it lasted only two years, it did much towards breaking down the conservative French resistance to Wagner, particularly with a concert performance of PARSIFAL, and even the first French performances of Beethoven's MISSA SOLEMNIS and Brahms' REQUIEM. He also served contemporary French music by premiering works of Roussel, Magnard, and others. In 1904 he became the conductor of the Concerts Populaires at Lille, and the following year he joined with cellist Pablo Casals and violinist Jacques Thibaud to form one of the greatest of permanently established piano trios, one which became a model of its type, touring frequently. This drew him back to the piano, which he had never given up despite his fame as a conductor. In 1907 he joined the faculty of the Paris Conservatory, teaching piano, but remained very active as a piano soloist and chamber music player. He gave up that position in 1917, feeling that his busy concert schedule had made it impossible to devote sufficient uninterrupted periods to teaching. In 1919 he founded the École Normale de Musique, assembling a faculty of famous musicians. As the director, he taught a summer course in interpretation, which became famous. He continued a career performing piano around the world, including lecture recitals, and also guest conducted many orchestras. He also continued to premiere new French piano music. Cortot was a skillful and scholarly editor of great piano music, famous for his editions of most of Chopin's piano music. Cortot's teacher was a student of Chopin, and the grace of his Chopin performances, especially, remains breathtaking and should be recommended to all students of the piano; he also had a remarkable way with the music of Robert Schumann.